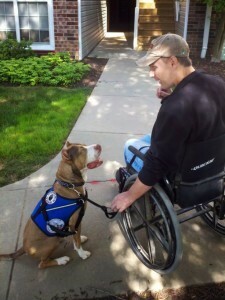 You make the call–Renters with service animals on a restrictive or “aggressive” breed list, is it allowed? Allowing pets in a rental property is often a debatable topic among rental property owners. Determining if you want to allow pets, what type of pets to allow, and what to charge for pet fees are just a few questions that may arise. But what happens when you choose not to allow pets and an applicant has a service animal? What if that service animal is considered an “aggressive breed” or on a restrictive breed list for your community? According to the U.S. Department of Housing and Urban Development, the Fair Housing Act protemotional support service dogects those with disabilities in need of service animals and/or emotional support animals. Because of this federal law, an animal considered to be an aggressive breed, such as a Pit Bull, is protected and must be allowed into a rental property if it is determined to be a service animal, despite any local laws that prohibit the breed. Have you had an experience with a service animal in your rental home? Please share your thoughts with us in the comment section below! We own our mountain home, I have only had issues with friends/Family who rent homes, apartments and RV camp grounds. Many landlords in California ban so called aggressive breeds, the list can be rather lengthy of these breeds. One apartment manager called the police when we refused to leave with our Pit Bull Terrier “Rebel”, she has been in training for a year to be a Service Dog. All our Service Dogs and “In Training” Service Dogs are licensed as such under State and County laws and we always have Video to cement our defense when the inevitable happens. This manger stated as renters are not allowed to have these breeds, guest are not allowed these breeds also, she then went so far as to claim Rebel was very aggressive with everyone. The only “Aggressive” behavior Rebel displayed, was vigorous licking of a little cousin who had fallen, gotten hurt and was crying. Some family members live in rental homes that ban dogs all together, it is shocking to me to see how many landlords and property managers do not know the laws. They also do not comprehend the legal situation they place themselves in when they refuse access based on ignorance of the laws of this country, or even worse they adds lies. Put simply how Officers and Judges view these and many legal issues “Ignorance of the law does NOT equal innocence of the law”. I have found a new love, respect and understating of Pit Bulls and German Shepherds (yes I have found some “Aggressive Dog lists include German Shepherds) after training several now. They are loyal, strong, loving, compassionate and most of all highly intelligent.